On November 13, 2016, our mountain lion research team fitted a second mountain lion with a satellite telemetry collar. The mountain lion is a juvenile female, estimated to be 13.5 months old, and soon to disperse from its mother. 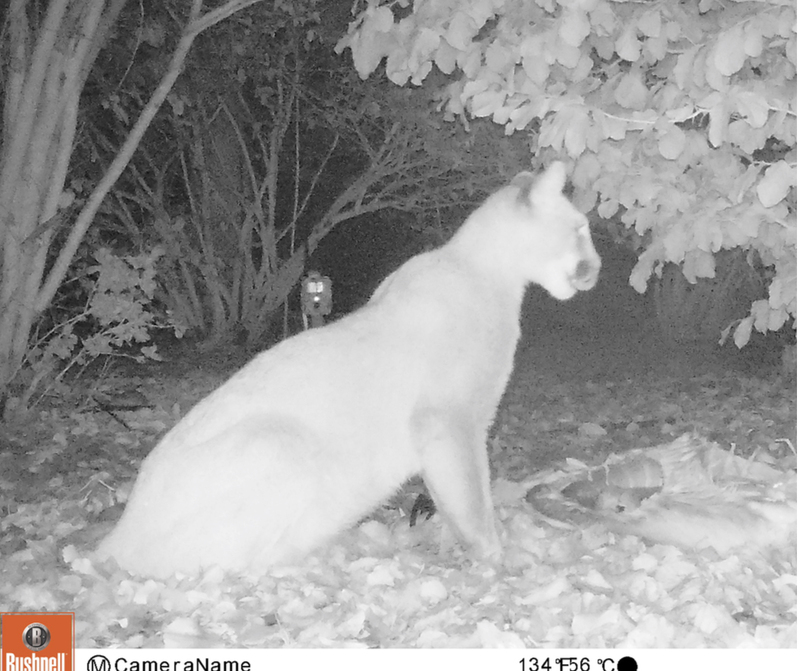 The team had tracked this mountain lion for a little over a month, after placing a collar on her mother in early October. The juvenile was captured on property bordering Annadel State Park near Santa Rosa, California. After outfitting the lion with a GPS collar, recording measurements and collecting biological samples for analysis, the research team released the mountain lion at the capture site. Named P2 (Puma 2) for our scientific records, the mountain lion weighs about 70 pounds and is in extremely good health. “Mom (P1) has been feeding her well!” noted Dr. Quinton Martins, ACR’s lead researcher on the project. The capture, led by Dr. Martins, was attended by ACR staff and veterinarians Dr. Jim Codington and Dr. Deana Clifford (California Department of Fish and Wildlife veterinarian), California State Parks Ranger Robert Birkland and veterinarian extern Dr. Claire Butkus. “The team worked exceptionally hard to make this capture and it finally paid off,” said John Petersen, ACR Executive Director, noting that this marks the second mountain lion to be captured and fitted with a GPS collar under a Scientific Collection permit issued to ACR by California Department of Fish and Wildlife in July. With full efforts starting in October, we have already completed two successful captures: an adult female ("P1") and one of her two offspring ("P2"). Now equipped with GPS collars, we are tracking their movements in real time, gaining insights into their daily activities and behaviors. Where GPS points are clustered together, these signify either a deer kill site, resting or even potentially a breeding site. Over 20 clusters have been logged in one month's data alone! “Monitoring the dispersal behavior of a juvenile female will give us significant insight into their population dynamics. Evidence of philopatry (where mom allows P2 to stay in or near her territory), dispersal behavior, evidence of survival or causes of mortality are but some of the key unknowns we will glean from these data,” said Martins. Results of this work will be closely monitored by CDFW, providing critical information for their statewide mountain lion conservation program. “As a community-based effort, we are especially grateful to the many landowners in this area who are interested and willing to provide us critical access to their land,” Martins added, noting that researchers set out to retrospectively monitor GPS location data to elicit information on the feeding and movement behavior of these cats. A cluster of sequentially occurring GPS points often signifies signs of a kill for instance. These could occur anywhere within the large ranges of these cats, and often fall on private land. 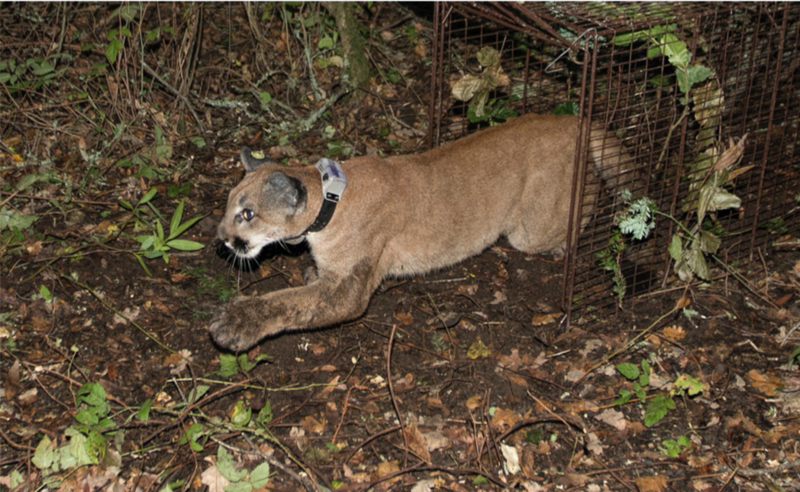 ACR’s researchers used a humanely-designed cage trap to capture the juvenile mountain lion. The trap was fitted with a satellite trap transmitter as well as motion-activated cameras, allowing the team to be notified instantly once the mountain lion was inside minimizing stress and possible injury to the animal. Biological samples will be analyzed at UC Davis, and will provide vital genetic and health information about the local population of mountain lions.